YikesVikes wrote: A rookie backup would be a bad idea. It also flies against what this team typical does. Routinely we have a starter, a vet and a young development talent. Sloter is no longer a rookie. He would be the young developmental talent. I feel like he's been on the team a year. He should be able to step in and play if need be. He can't be worse than Geno Smith. I also think they should draft a Qb. The best time to draft one is when you have one with 2 to 3 years left on their deal. Maelstrom88 wrote: I feel like he's been on the team a year. He should be able to step in and play if need be. He can't be worse than Geno Smith. I also think they should draft a Qb. The best time to draft one is when you have one with 2 to 3 years left on their deal. Traded for a Vet. Speilman has his recipe and doesn't variate from it. Yeah Siemian is a pretty decent backup as long as they didn't give up more than a 5th. For those that believe Cousins isn't worth it. Something to chew on. In games were Cousins started or played significant time, I went back and looked at the scores of those games. In games he lost, the Skins average 19 points while giving up 29 points to opponents. In games the Skins won, they put up 29 points on average to 19 for opponents. Now, I'm not saying this is the end all stat, just something interesting. Since the Vikings defense has given up an average of 17.9 points per game the last 3 years. Raptorman wrote: For those that believe Cousins isn't worth it. Something to chew on. In games were Cousins started or played significant time, I went back and looked at the scores of those games. In games he lost, the Skins average 19 points while giving up 29 points to opponents. In games the Skins won, they put up 29 points on average to 19 for opponents. Now, I'm not saying this is the end all stat, just something interesting. Since the Vikings defense has given up an average of 17.9 points per game the last 3 years. Cousins haters, chew on this: Arizona is spending $28M per year for Bradford and Glennon. Vikes will spend $29M for Cousins and Siemian. Vikings' dinner party with Kirk Cousins tonight includes Mark Wilf, Adam and Caitlin Thielen, Kyle and Jordan Rudolph. I still have my opinion of him but he's a Viking now so I'm hoping for the best. Watching more highlights, I do like his quick release. I thought this was...f'n weird and so incredibly...Vikings. @stensation Fact: In Kirk Cousins' final game at Michigan State, he threw an interception in overtime of the Outback Bowl but Georgia's Blair Walsh missed a field goal to send it to a second OT. Sparty then won when Walsh's 47-yarder in 3rd OT was blocked. haha no not at all. I'm just saying Cousins haters in general. I honestly cant even remember if you are one or not. It's so back and forth on the board. Die hard Redskins fan here. I'm glad Cousins signed with you guys because now I have a legit reason to root for a second team and somewhat escape the purgatory of being a Skins fan. I'm not saying I'm trying to be a die-hard Vikings fan but I will be taking an interest and watching as many Vikings games as I can this year. You're going to like Cousins. Sure, he'll throw a bad pick at an inopportune time but he's also going to work his #### off for your team and come prepared each and every Sunday. No QB is perfect, Cousins isn't but he's made his way from being a mid round pick and a backup to being a starting caliber QB. IMO, he's a top 10 QB. He didn't have his best year statistically last year but when you realize our inept front office took away his two best receivers (DeSean Jackson, Pierre Garcon) , had absolutely no running game, spotty offensive line and didn't have one of his best playmakers healthy for practically the entire season (Jordan Reed), and lost a dynamic playmaker who was having a breakout season partway through it (Chris Thompson) it's a miracle that he somehow threw for 4,000 yards and as many touchdowns as he did. The picks aren't a terrible number to me, especially considering that most teams knew we were going to throw it anyway and that Cousins was essentially a one man show. IMO, throwing for 4,000 yards when your leading receiver didn't come close to 1,000 is a big feat. He's not afraid to throw it downfield or go for big chunks of yards, I'm looking forward to seeing what he can do with Adam Theilen and Stefon Diggs. You also have a stout defense which will help, too. You guys also play in a dome, which is nice. The Fed Ex field conditions are notoriously crappy and Cousins can scramble a little bit and buy some time with his feet so I think he can improve there, too. I'm really happy for you guys, you got a good QB that's also going to be a part of the community off the field and be a good citizen. Certainly no off the field drama to be leery of, he's a really stand up individual. Not sure how much time I'll be spending on here but thanks for allowing me to be a part of what looks to be a great community. 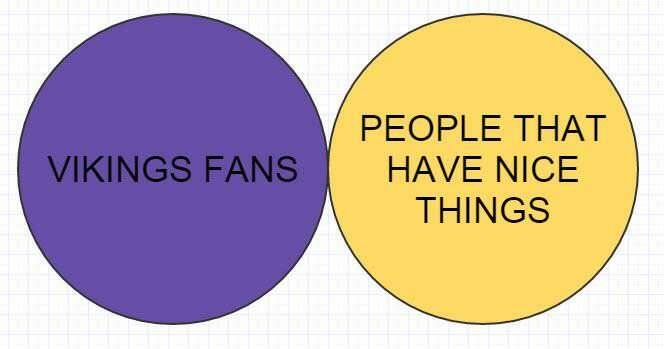 Wouldn't be surprised if there's suddenly a lot more Vikings fans in the DC area this week. You're the second Skins fan that has came on here and he also said the same thing. Thanks for the input. I've been saying a lot of similar things as well. I cant stand when fans just look at "record". There is so much more behind that. Washington did not put a good TEAM around him. I'm so glad we made this signing. Hope to see you on here more. You're absolutely right. The Skins failed to put a good team around him. One thing that I forgot to mention which you guys should appreciate after Bradford and Bridgewater, he's also very durable. I believe he's started all 16 games each season throughout the time he was a starter for us. I've seen him take some massive hits and get back up.